Koheilan I 1922 (Koheilan IV-10 1905 x Gazal IV), sire of *Lassa, was foaled in 1922 at the Hungarian State Stud at Babolna. He was imported to Poland in 1924 where he served as chief sire in the Polish State Stud at Janow Podlaski for several years, playing an important part in that country's regeneration of horse breeding after its almost complete destruction in the first World War. 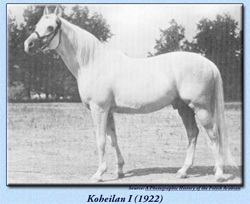 Koheilan I 1922 was given the designation of the number "I" as he was the first of that sire line in Poland. 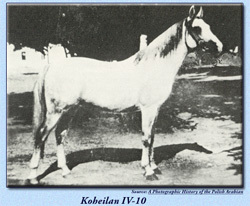 Koheilan I 1922 was repurchased in 1937 by the Hungarian State Stud for service at Babolna where he was given the next in line number for the "Koheilans" and became number "VIII". Thusly both Koheilan I 1922 and Koheilan VIII can be found as names in his descendants depending upon whether they came from Poland or Hungary. In Poland Koheilan I 1922 left a very large number of race winners including three winners of the Derby: the grey mare Ikwa (1931 Derby winner), the grey mare Jagoda (1932 Derby winner) and the grey stallion Labirynt (1934 Derby winner). Koheilan IV-10 1905 (Koheilan II x O'Bajan 1898), grey stallion foaled in 1905 at the Royal State Stud at Babolna in Hungary, became one of the most noted sires at Babolna. 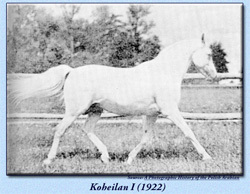 Sire of Koheilan I 1922 and Koalicja (dam of Enwer Bey). Koheilan Ad-Juze was bred in the desert by the El Seba tribe of Anazeh and imported to Hungary about 1880 where at the Royal State Stud at Babolna he founded the only male line through which any Arabian imported by Travelers Rest traced, including the beautiful mare *Lassa who is of influence in the pedigrees of Arieana's foundation bloodstock. His tail male line descends in our pedigrees at Arieana Arabians through Koheilan II 1887, sire of Koheilan IV-10 1905, sire of Koheilan I 1922. 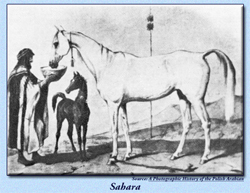 Sahara (Desert Bred x Desert Bred), a celebrated mare imported to Poland from Arabia in1845 by Count Julius Dzieduszycki. Foundation mare for the tail female line of descent to *Lassa through her dam Zulejma 1914. Strain: Kehilan-Mimrih. Zulejma 1914 (Kohejlan d.b. x Pomponia 1902 by Zagloba), bay mare bred by Count Ladislaus Dzieduszycki and foaled in 1914. 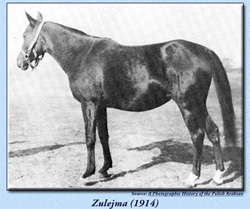 Zulejma 1914, along with her dam Pomponia 1902, were sold by her breeder to Mr. Przewlocki and then again to the purebred Arabian division of the Polish National Stud at Janow where Zulejma 1914 founded a strong family. Among her produce were her beautiful daughters *Lassa by Koheilan I 1922 and Dziwa by Abu Melch. (Just as an aside, Dziwa was also the dam of *Niwka imported by Travelers Rest Arabian Stud in 1938 and also dam of the famous stallion Ofir; neither of these two horses appear in the pedigrees of Arieana's Arabians). Zulejma 1914 traces in tail female to Sahara. Strain: Kehilan-Mimrih. Benenson, Leslie. Personal Communication. San Juan Capistrano, California. March 13-14, 2006. Dickinson, J.M., A Catalogue of Travelers Rest Arabian Horses 1947. Reprinted by the Arabian Horse Trust, Denver, Colorado. 1988. pp. 34, 121-123, 189, 197. Edwards, Gladys Brown, A Photographic History of the Polish Arabian. Arab Ink, Rockville, Maryland. 1978. pp. vii, 89-90, 120, 134. Copyright � 2003-2012. Website designed and maintained by Suzi Morris and all rights reserved. This page created for Arieana's Racing Notebook on July 17, 2005. Updated with new information April 9, 2006. Updated and Current as of August 11, 2012.